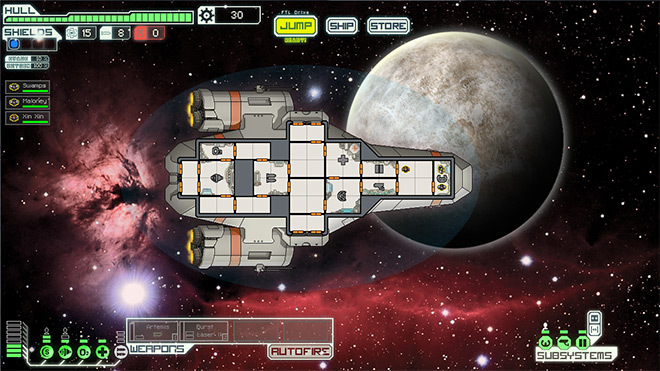 I love FTL and I do like retro and pixel graphic. But I'm not a huge fan of the background graphic of FTL. They seem low res (especially the nebula animations). Some of the planets and galaxies look like they were painted over with an impressionist brush in Photoshop. So, I decided to replace the planets and backgrounds with higher quality versions, trying to stay as close as possible to the original subjects - and add a couple of new ones. The only thing this mod (or should I say reskin? Not sure about the nomenclature) does is replace the background graphics. That is planets, sun, stars, galaxies and the nebula. No other textures (ships etc) are being modified. Please note: For the added backgrounds and planet, I had to modify the file events_imageList.xml (append is not possible in this case). Keep this in mind if you use any other mods that altered that file. In the vanilla version of the game there are only 9 planets + 1 sun. Therefore, the backgrounds get pretty repetitive after a while of playing. In V1.0I added 4 new backgrounds + 1 planet. In future releases I might add more graphics. Let me know what else you want to see and how I can improve this mod. Maybe, if Justin & Mathew are interested, it would be great to integrate this into a future update of the main game. What do you think? 3. Run GMM. Select "Highres Backgrounds V1.0" from the mod list and click OK.
4. Once GMM is finished repacking, run FTL, and enjoy! Last edited by splette on Tue Oct 02, 2012 7:42 am, edited 2 times in total. Looks good The only one that bugged me before was the really low quality nebula clouds, good to see you replaced them! Love FTL? Wish you could fly around in the USS Enterprise, the Tardis, or a ship that looks just like your own face? Check out FTLEdit, a ship editor for FTL, so you can create your own custom ships and play them! Don't forget to share them too! Like you, I'm not too found of the pseudo-low-res nature of the backgrounds in FTL. However, they've been voluntarily done this way, that got me thinking that maybe more detailed backgrounds would distract the player and make it harder to spot the smaller elements of the GUI. The changes you show are nice-looking, but you could post a screenshot of an ongoing ship fight, so we can see how they look in real use? Forum janitor — If you spot spam, PM me the URL and/or the username of the spammer. I have powers, moderator powers. I am not keen on using them, but will do so if needed. I was also wondering why they did that. My guess is that they somehow wanted to match the pixel graphic of the foreground with some lowres graphic in the background. But it doesn't match very well in my opinion. I understand the concern about the background being too distracting but the problem is a different one. The graphics being a little more precise or washed out doesn't make any difference in terms of distraction. What does is what is shown in the background. Some of the backgrounds are just black space with a few tiny stars and then one planet. But there are three background images that show colorful nebula. They have a high contrast and are very busy. They might indeed considered distracting by some. But it doesn't solve the problem of the busy backgrounds and the pixellation doesn't match well with the rest of the graphics, so I dropped that idea. Anyway here are some screenshots. This one has one of the detailed galaxies in the background. 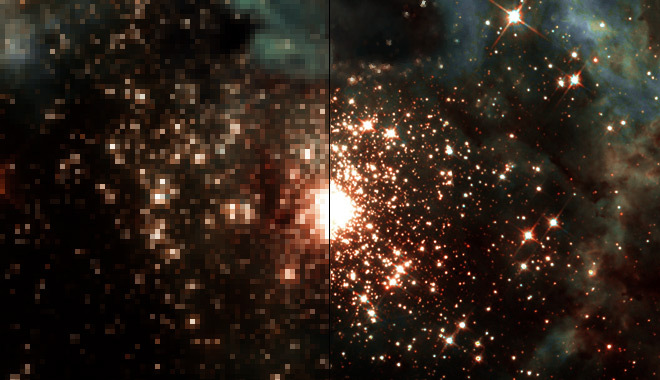 If there is a consensus here that the nebula are too much, I could reduce their complexity. But if you are not distracted by them in the vanilla version of FTL, you probably won't be bothered by my updated nebulas either. So, let me know what you think. PS. You might notice another modification on my screenshot. Something else I am working on seperately. This is great! Can't wait for the release! Really good work. It looks great. I wouldn't worry about distraction, I don't think it's a real issue at all. Original background were a little bit dissapointing. I remember what I felt for the first time I had those events claiming that "it's so beatiful here". Well, I read that, then I looked at the background and thought "not really". I am pretty sure you can add more planet images. Have a look at events_imageList.xml in data.dat. The contents should be pretty self–explanatory. This is amazing. Looking forward to it! And if you want to de more, original backgrounds/planets, then I'd appreciate it even more!